Early in my career as a landscape architect, I designed Bradford pears into many projects. So did most everyone else in the landscape business. As the pears started dying of root diseases and began breaking apart in wind storms because of the tight, upright branching structure, most designers and contractors stopped using them. On the other hand, many are still being planted. First of all, there are many ornamental tree choices that are better – flowering plums and peaches, crabapples, dogwoods, redbuds, Japanese maples, Persian ironwood and styrax for example. But if you want to use ornament pears, change to Aristocrat or the species plant called Callery pear. They have much better structure and will last much longer. 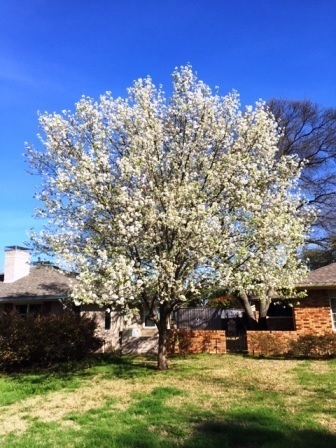 If you continue to use Bradford pear, consider it a short term source of Spring and Fall color and enjoy it until it falls apart. Here’s the updated newsletter we did on this plant in the past.